What are the geopolitics of open source? To find out I thought it would be interested to see how Thomas Barnett’s map meshed with the Spread Mozilla Firefox 3 download pledge map. 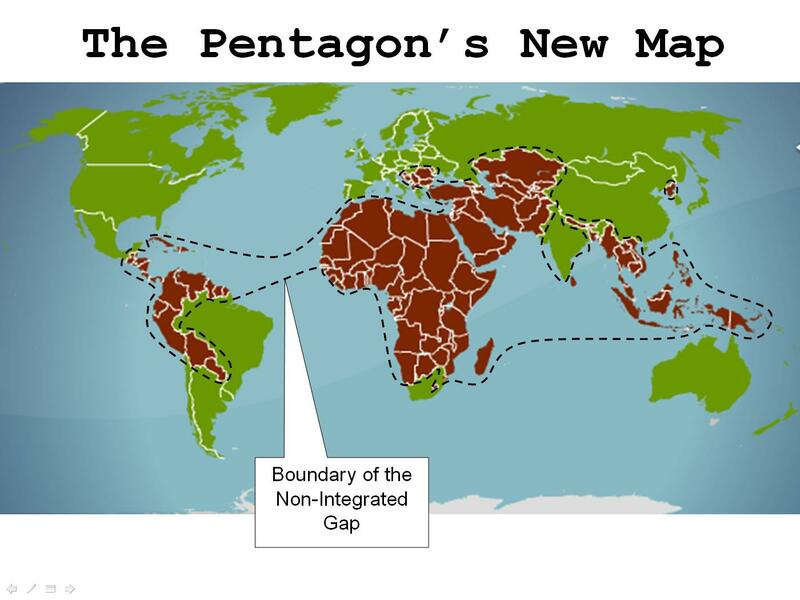 Some brief background for those not familiar with “The Pentagon’s New Map.” It is a map that sits at the heart of a book of the same title written a few years ago by Barnett. It is a compelling take on what America’s grand strategy should be for the 21st century and how it is, and more importantly isn’t, ready to execute on it. Better yet, it is engaging, thought provoking, interesting, and written so anyone can read and understand it. The world is divided between the Functioning Core and the Non-Integrated Gap. According to Barnett’s thesis, countries in the Non-integrated Gap, because they are less connected, should probably have fewer computer users, fewer people downloading software and fewer people participating in Open-Source projects. Mashing up his map with the Firefox pledge map might give us some a clue to how well open-source conforms to his thesis. (Note, I’ve remixed Barnett’s map to make it is easier to read on a computer with the Function Core countries in green and the Non-Integrated Gap countries in red . You can find the original map here. 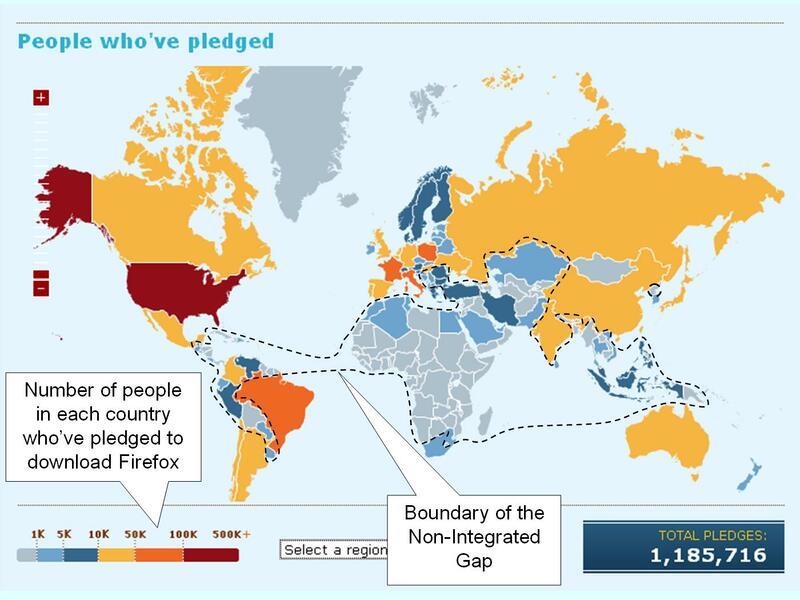 Below is the spread Firefox pledge map, which tracks how many people around the world have pledged to download Firefox on its release day (June 17th). I’ve overlaid the Non-Integrated Gap/Function Core border over it. Non-Integrated Gap countries with the most pledges are Iran, Turkey, Venezuela, Peru, and Indonesia – interesting list. Seems to suggest that many of the countries the US tries to isolate are actually the most connected. According to my Mozilla friends Poland (yes, Poland) was the first to hit the 100K pledge mark. Many new Core countries are adopting Open Source en mass to avoid paying for expensive Microsoft software. Open source may be offering them a cheap way to increase connectivity and integrate with the core faster, and on their terms. Fantastic outcome. Lots more thoughts and analysis to be done on this. I hope to blog more on this shortly. If Barnett responds in any way I promise to update – would love to hear his thoughts/reflections on this. This entry was posted in open source, technology, united states and tagged firefox, geopolitics, grand strategy, iran, mozilla, open source, Pentagon's New Map, spread firefox, technology, Thomas Barnett, united states on June 16, 2008 by David Eaves. Yes, per-capita data would be nice – the SpreadFirefox page is quite bad in that regard, since it’s pretty much automatic that countries with many millions of people will have more pledges than a country with just a few million. Australia for example is orange, with about 0.11% of the population. NZ is about the same at 0.12%, yet shows up as blue. The United States is red, yet has only 0.08% signed up… China is also orange, yet has a mere 0.002% signups from their billion+ population. Yes, per-capita data would be nice – the SpreadFirefox page is quite bad in that regard, since it’s pretty much automatic that countries with many millions of people will have more pledges than a country with just a few million.Australia for example is orange, with about 0.11% of the population. NZ is about the same at 0.12%, yet shows up as blue. The United States is red, yet has only 0.08% signed up… China is also orange, yet has a mere 0.002% signups from their billion+ population. Backpacking around the world has been pretty informative so far. All where i stayed as I travelled through Poland were running Ubuntu (or Kubuntu), Open Office and Firefox. No only does that free the hostel from paying for Microsoft software, but it also allows them to run older hardware (still with decent performance) and save the administrative expertise required to secure Windows PCs. Of course, it’s possible to secure a Windows computer, but you need to know what you are doing to do it properly, whereas Linux sort of offers protection by virtue of the fact that so many viruses and spyware just don’t run on that O/S. One other interesting note is that many people (who I would not classify as geeks) were packing the Asus eeePC, which suggests to me that the actual operating system is sort of fading into irrelevance as the browser becomes ~the~ platform and some interface through which users access nearly everthing they use: email, social networking sites, and multi-media management (photos, video, music). Please excuse the errors in my postings. I am posting from my iPod sitting in cafes in Budapest. Fascinating correlation and thank you for sharing the Burnett TED video link. He is a provocative, passionate and entertaining speaker. Very interesting stuff, David, and I can’t wait to see what you do with the per-capita data. Meanwhile, our friends at SpreadFirefox have a live map of downloads – http://www.spreadfirefox.com/en-US/worldrecord – it more or less mirrors the pattern you’ve described. Very interesting stuff, David, and I can’t wait to see what you do with the per-capita data.Meanwhile, our friends at SpreadFirefox have a live map of downloads – http://www.spreadfirefox.com/en-US/worldrecord – it more or less mirrors the pattern you’ve described. Pingback: tdaxp » Blog Archive » Join the Core, Support Firefox! The population corrected map would be nicely accompanied by a map corrected for the number of web users. This would give a sense of which countries Firefox is capturing “market share” in. The next step would be to try to understand what policies those countries have that make Firefox a more attractive choice. Thomas Barnett thinks that he worked out the whole thing and the American military will just easily go with its might and accomplish its tasks mainly in the Third World. Well he should think twice. All those countries that the U.S. would like to divide and conquer is a big joke, They are not for prosperity and peace in the Third World but for their own benefits. Just by invading Afghanistan and then Iraq with satanic lies is not a way forward but for self U.S. military destruction. Alexander the Great, the British and the Soviets that were empires all were trapped in the Afghan Trap mainly and even today by the Pashtuns. So think and it means get out fast or it will be another humiliation worst than Vietnam. 2OO1 is gone and it's almost 2009. So? Well Pashtuns are still fighting. And they will til the end. Again think or better read the history til you learn. Allahu Akbar – means God is Great. your blog is great 695 gratz! When we were writing The Power of Nice, we uncovered many facts on how nice behavior can benefit your life.